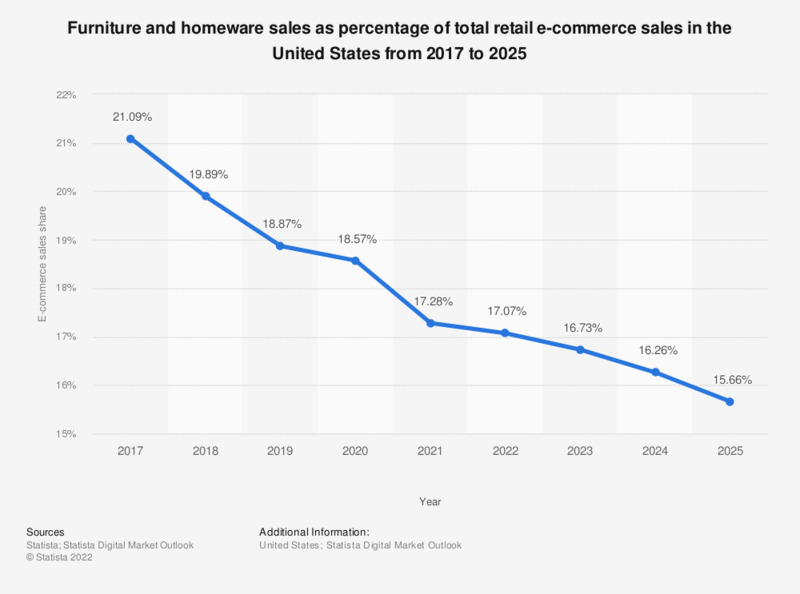 The statistic shows the share of furniture and home furnishings sales in total U.S. e-retail sales from 2017 to 2022. Furniture and home furnishings sales are expected to account for 14.4 percent of total retail e-commerce sales in the United States in 2023. Online furniture sales represent one of the strongest e-commerce sales categories in the United States. In 2016, the e-commerce value of U.S. furniture and furnishings manufacturing shipments amounted to more than 40.7 billion U.S. dollars. Overall, the e-commerce share of U.S. merchant wholesale trade sales of furniture and home furnishings amounted to 20.9 percent. The growing online presence of traditional brick-and-mortal retail chains such as Target, the global expansion of multi-channel lifestyle brands e.g. Anthropologie as well as the U.S. subsidiaries of international retailers like Otto Group-owned Crate and Barrel are all factors in the trajectory of online furniture sales. Global competitors such as IKEA complete the picture. The increasing prevalence of online shopping as well as online flash sales, special offers, extensive product selection and home delivery are important influences that determine the demand and popularity of online furniture sales. Social media sites like Pinterest or lifestyle blogs also offer more exposure to interior design topics, prompting consumers to take a keen interest in DIY or redecorating. The strong online presences of contemporary tastemakers and trendsetters also impact and influence retail e-commerce sales. Current U.S. –based examples include Emily Henderson, who recently established collaboration with Target, as well as Joy Cho who has licensed product lines with various retailers.